Bob Lester - Accessible Archives Inc.
As the presidential inauguration fast approaches, let’s take a quick look back at some presidential inaugurations that were “memorable.” Frank Leslie’s Weekly provided unique reporting, complete with graphics and later photographs, of several presidential inaugurations during its publishing run. 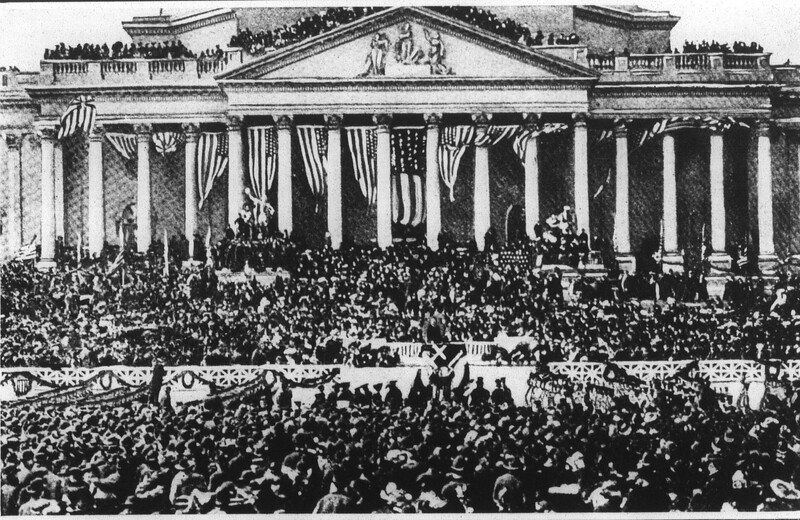 Comparing early presidential inaugurations with contemporary ones, was a common feature in Leslie’s Weekly. Check out the article below, entitled “Some of the Most Memorable Presidential Inaugurations,” and then tune into the upcoming inauguration. When, on April 30th, 1789, George Washington was inaugurated as the first President of the United States, the country had only eleven States (for North Carolina and Rhode Island did not ratify the Constitution or come under the government until many months afterward), all of which were east of the Alleghanies and north of Florida, which was Spanish territory until a third of a century later. New York City, then the national capital, with its 4,000,000 inhabitants in 1905, has 1,000,000 more people and many billions more wealth to-day than the entire United States had at that time. Yet April 30th, 1789, was the proudest day which New York City had seen in the century and two-thirds which had passed since Peter Minuit, representing Maurice of Nassau, the Stadtholder of Holland, bought the island of Manhattan from the Lenni-Lenape Indians for a gift of sixty guilders, or twenty-four dollars, in beads and ribbons, and started the colony of New Amsterdam on its picturesque career. The holiday season is upon us! Schools will be closing shortly and students will be looking forward to some time with family and friends. I can remember when I was a child that our last class assignment before the holidays was to write a paragraph on the meaning of Christmas. Most of the students in class focused on the toys and food, Santa Claus and his chimney escapade, and maybe the fact that we could play all day. But, there were always some students that wrote about other things – peace on earth, thankfulness for a good harvest, or religious views on the holiday. When these students read their paragraphs out loud to the whole class, you could hear a pin drop. These are the memories that color our holidays. Make memories this holiday season for yourself and those around you. Have a safe and happy holiday. The article below from Frank Leslie’s Weekly asks that question that seems to surface this time of the year – “What is the meaning of Christmas?” This question appears several times in Frank Leslie’s and the articles provide a unique perspective on the meanings of Christmas. 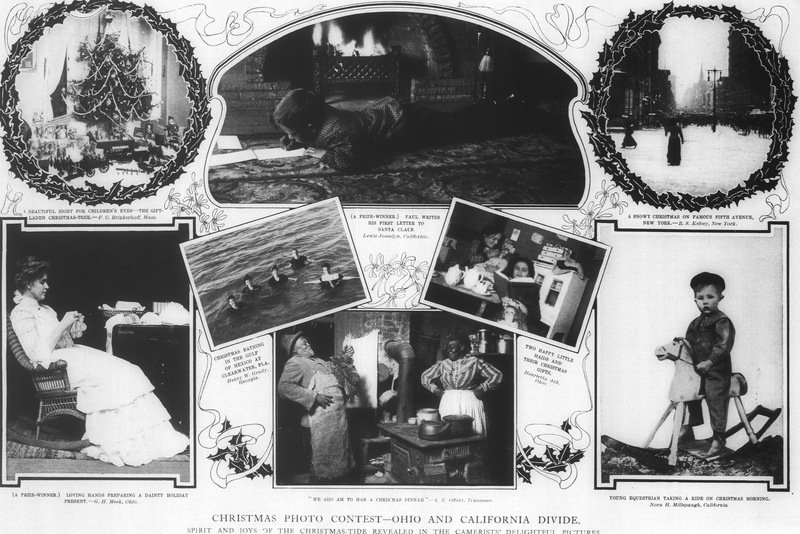 There are also a wide variety of articles on other aspects of the holiday, such as the Christmas tree, Santa Claus (and Saint Nicholas), toys, and the North Pole. Students and researchers in American Studies and other academic disciplines will find a treasure trove of primary source information in Frank Leslie’s Weekly on holiday celebrations and their relationship to culture, and identity. Students and researchers will find the American County Histories a treasure trove of detailed information and recollections on weather and climate of a particular region. Disasters that a region has suffered, especially violent storms, extended weather patterns and other natural disasters are well documented in these histories. Explorers, missionaries, sea captains, and settlers maintained climate and weather records – to determine favorable winds, for agricultural reasons, to know when inland waterways were usable, to prepare for settlement, and more. The excerpt below highlights observations on the climate in the Hawaiian Islands by a New England missionary and member of the American Oriental Society. His first-hand observations provide a unique look at Hawaiian weather, including temperature changes, rainfall, climatic changes in terms of elevation, Hawaiian folklore names for winds, and more. The climate is salubrious, and possesses a remarkable evenness of temperature, so much so that the language has no word to express the general idea of weather. Remarkable changes, such as a severe storm, or long periods of rain, which on the more populous portions are of rare occurrence, only attract notice. 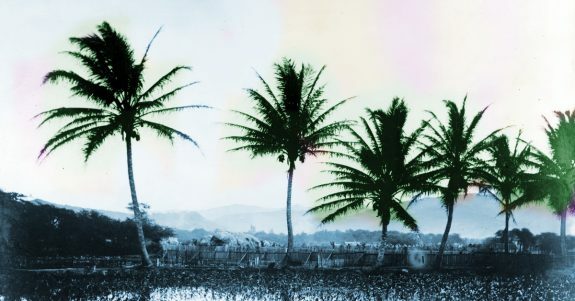 Situated in the midst of the Pacific, the heat produced by a tropical sun is mitigated by the breezes which blow over the wide expanses of ocean, and the shores on either side show but little difference in the results of the thermometer. Physiologists give a certain point of temperature as most conducive to health and longevity. The mean heat of these islands approaches near to it, and is highly favorable to the full development and perfection of animal economy. The electoral process throughout American history has run its course with only a few major issues in the past 240 years. The 1876 presidential election has been used as the historical yardstick in determining the good and bad of the election process. After a hard fought campaign between Rutherford B. Hayes and Samuel J. Tilden, the final election results brought widespread charges of voter fraud coming from both candidates. Eventually, Congress stepped into the electoral process and selected an electoral commission charged with the task of “selecting” a president. There was great concern that the partisans of the losing candidate might revolt, so Federal troops were activated in Washington, D.C. and in other large metropolitan areas throughout the country. Eventually, a president was selected and the fear of popular agitation subsided and America resumed its political stability. During the presidential election of 1916, the alarm was raised that there might be the need for voter recounts. But, the specter of the president election of 1876 loomed large in the minds of politicians and candidates. The article below from Frank Leslie’s Weekly broaches the possibility of a vote recall in the final results of the Presidential Election of 1916. It cites the various issues that had been raised during the 1876 election. Researchers interested in the history of America’s political process and the role of popular activism will find Frank Leslie’s Weekly a treasure trove off unique information covering many phases of America’s political and popular legacies. notably California, Minnesota, New Mexico and North Dakota. The Democrats also threatened to demand a recount in several States that went Republican. 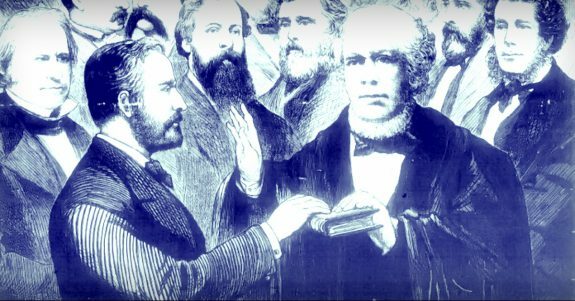 This recalls the election of 1876 when contests were inaugurated in Oregon, Louisiana, Florida and South Carolina. The matter was taken before Congress, as provided by law, and an Electoral Commission of 15 members was appointed. 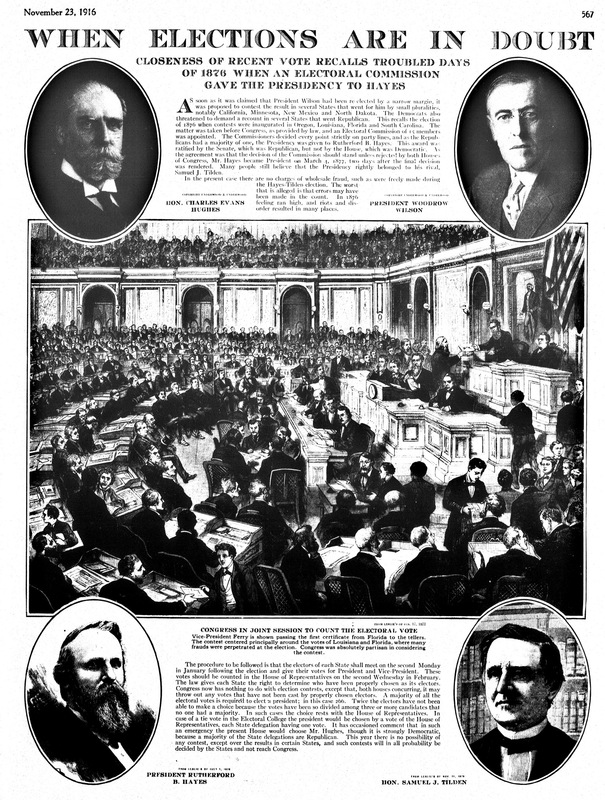 The Commissioners decided every point strictly on party lines, and as the Republicans had a majority of one, the Presidency was given to Rutherford B. Hayes. This award was ratified by the Senate, which was Republican, but not by the House, which was Democratic. 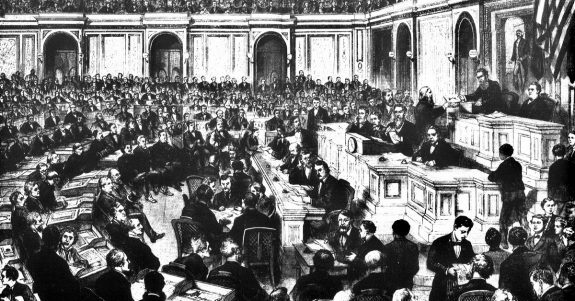 As the agreement was that the decision of the Commission should stand unless rejected by both Houses of Congress, Mr. Hayes became President on March 4, 1877, two days after the final decision was rendered. Many people still believe that the Presidency rightly belonged to his rival, Samuel J. Tilden. In this day and age, every word and every sound bite from a President is captured and re-circulated through social media, broadcast and online news reports, and in print. Today’s president has a substantial communications staff. They create, manage, and collect all sorts of information. This staff impacts public perception of the president, his policies, and his administration. One may ask if this is a 20th century phenomenon or if this has always been case? 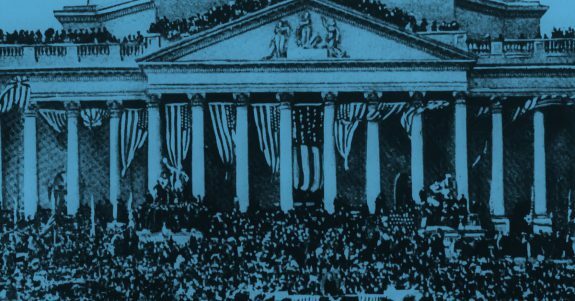 In looking back at presidents in the 19th Century, their utterances were captured by journalists and printed by a variety of newspapers, illustrated weeklies, and political ephemera. But dissemination was spotty. Not until the telegraph did news reports span the nation quickly enough to really impact a president or campaign. This article is one of many that can be found in Frank Leslie’s Weekly on politics, politicians, election campaigns, congressional issues, and even the president’s thoughts and musings (or lack thereof). 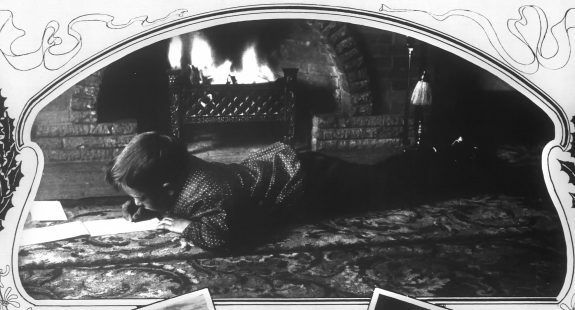 Political cartoons, drawings, and eventually photographs were essential in conveying views on specific issues and politicians to the partially literate and illiterate public. 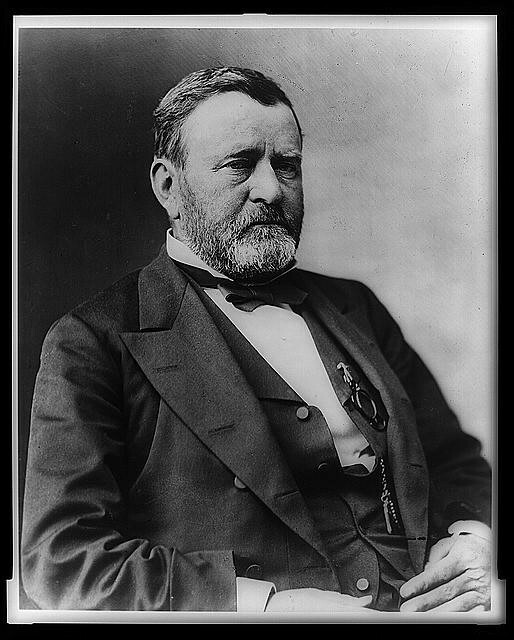 It is generally supposed that under the coming administration of President Grant there will be a great change in the conduct of public affairs, and we are not sure but that there are good grounds for such a belief. Already in the debates in Congress we see a shadow of coming events, and if the rising sun has so much power, what may we not expect from its meridian splendor? The plaintive pleadings of the Danish Minister that we should exchange dollars, of which we have too few, for land which he has to spare, but of which we have quite enough, fall on ears deaf to the voice of the charmer. The more robust and potent influences of the managers of railway schemes fail to extort from Congress enormous grants of the people’s lands for their own sordid purposes. Everywhere there are signs that greed, peculation, and corruption are vanishing before the advent of an able and purified government, and the people rejoice and take courage. It would be exaggerating the influence of the Presidential office to say that the personal habits of our Presidents have made any impression, even of a transient kind, on the people of their times. Even the intense individuality of Andrew Jackson failed to leave a mark on his generation, and a few terse phrases, familiar to everyone, are all that survive of that fiery character. It will not be held by any one acquainted with the true spirit of our republican institutions that the deficiency we allude to ought, in any respect, to detract from the veneration due to the characters of a long line of illustrious Presidents. It may be, indeed, that the possession of any strongly marked peculiarity of character, or even of dress, or of speech, would be fatal to the hopes of an aspirant to the Presidency, and we will not dispute the justice of the popular belief, that the qualities of mind and heart required in a President are incompatible with the existence of those distinctive traits by which men of inferior mental and moral calibre seek to attract to themselves the attention of the public.